Joyce Marchant and Jill (her dog) at the plowing match. It's not your average competition. Dugan Montjoy, one of the entrants, describes it as "relaxed". The annual spring plowing contest held near Kamloops by the Inland Draft Horse and Teamsters Association is also a glimpse into a quiet, family-oriented rural life that's almost vanished. Mind you, the competitors are serious. And, they're good. Irwin Walters, from Sorrento, won the B.C. Plowing Championship at Chilliwack the week before he competed at Kamloops. Rules are strictly enforced, plots outlined and measurements taken on the three and a half acre field. Straight smooth furrows, uniform depth and flatness when done are carefully considered before prizes are awarded. Every competitor is keenly aware of the difference in depth between a furrow and an irrigation ditch. The two day event is held at Bob and Tracey Haughton's ranch. Plowing, prize giving and a barbeque take place on Saturday. 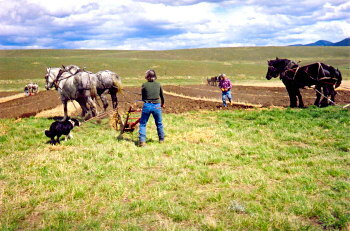 Disking and seeding using draft horses and restored farm equipment are done Sunday by everyone who's handy. Sunday's not a competition. At the April 29, 2006 event entrants came from Armstrong, Lillooet, Sorrento and Kamloops. Glen Escot, with a team of Belgians, was the only one driving a sulky plow; the others used Percherons and walking plows. What makes this contest different? There are no stopwatches. The day starts slowly with an open-air pancake breakfast. Contestants and audience sip coffee and chat while gazing out across the fields to the hazy hills beyond. A long abandoned homestead in a nearby gully and a house in the far distance are the only reminders that there are other people in the world. Up here, on the rolling grasslands, it's just traditional farm equipment, draft horses and the people who love them. 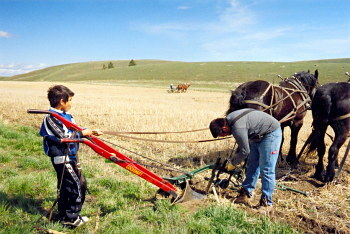 Tristan and Dugan Montjoy-adjusting the plow. A soft wind brings the songs of meadowlarks. Some breakfasters take their coffee along as they stroll over to admire the large raven's nest in the open equipment shed which also shelters a Woods thresher, the silent auction items and the prizes. The teams are hitched when everyone's ready. There are no yells of encouragement for one or boos for another. Except for "gee", "haw", and "whoa", the morning is hushed. The only raised voices all day debate the height of a black Percheron said to be nineteen hands high. In one fellow's opinion "Neither that horse nor any other horse is nineteen hands high!" A closer look at the horse in question and the voices lower. All day the horses go about their work, pulling when asked, standing calmly while measurements are taken or plows adjusted, never shying or balking. Dogs are on their best behavior. Not one barks, growls, begs for food, picks a fight or spooks the horses. Jill, Joyce Marchant's border collie, faithfully accompanies Joyce and her horses along the furrows. Jill knows she's part of the team. And the children? The baby, Glen Escot's grandchild, cries, but only a little, just until it's fed. The others, from toddlers playing trucks in the grass, to teenagers making new friends, amuse themselves. There isn't one "I'm bored, there's nothing to do, can we go now?" complaint all day. It truly is a family event, even for the contestants. The Montjoy family from Lillooet, represent three generations. Don and his son Dugan are plowing. Tristan, Dugan's ten year old son, is his helper. Tristan works patiently through the long day, putting in pins to mark the plot, holding the reins while Dugan cleans grass off the plow. Polite children, restrained dogs, a quiet, appreciative audience; what sort of contest is this? Don Montjoy (with puppy), winner of the 2006 competition. Competitors: l-r, Erwin Walters, Don Montjoy, Tristan & Dugan Montjoy. There was no official judge so the plowers got together to choose the winner themselves. What an opportunity to see their true character! As they talked among themselves, assessing each other's work, they made some telling comments. "Your crown's pretty good." "Nah, too much grass. Yours is nice and even." There are no win-at-any-cost attitudes. 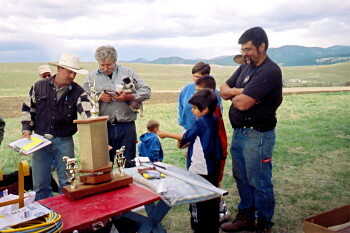 When all the marks were tallied Don Montjoy was declared winner and took home the trophy. There are merchandise prizes too so everybody comes away with something. The wind was rising and clouds coming in from the west as organizers took down the silent auction display. The audience turned away reluctantly from a place where competition could be friendly and families worked together, thinking, as John van Leeuwen said, "How many people pass by not knowing that, if they turned to the left, just up the hill, there's another world?"